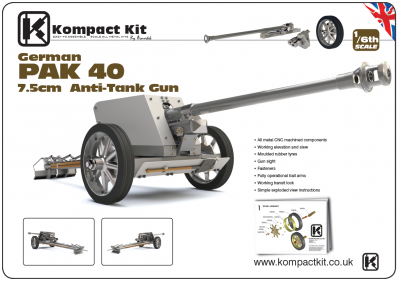 The Pak 40 (Panzerabwehrkanone 40) was a German 75mm anti-tank gun developed in 1939-1941 by Rheinmetall following concerns that the smaller 50mm Pak 38 would not be powerful enough to deal with the new Soviet tanks. Following introduction to Service in 1942, the Pak 40 went on to form the backbone of German anti-tank guns for the latter part of World War II, mostly in towed form. By the end of the war approximately 20,000 Pak 40s had been produced. The Pak 40 had the gun mount seated on a carriage with two rubber tyred wheels. Split trail ends doubled as both recoil legs and as a carriage tow arm. The three panel blast shield provided a low profile allowing for easy concealment.